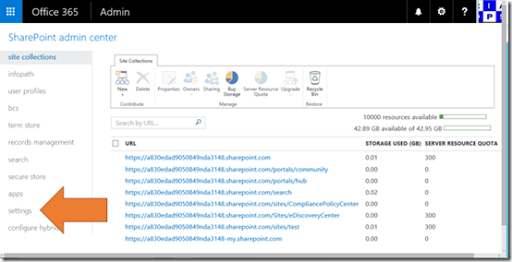 You can protect the documents you save into SharePoint Online so that they can’t be opened by people without the appropriate security. 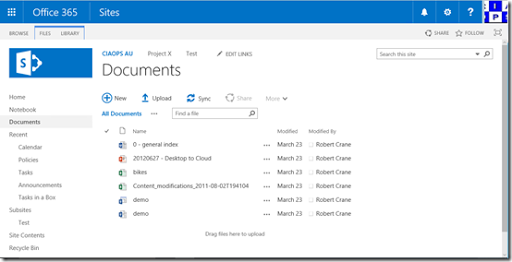 This prevents situations where a confidential file is downloaded from SharePoint Online and then forwarded to someone that it should be for example. So check out that post to find out how to enable right management in Office 365 and then return here to find out how to use it with SharePoint Online. After rights management has been enable in Office 365 you’ll need to enable it also in SharePoint Online. Go to the SharePoint admin center and select Settings from the menu on the left. Scroll down the options on the right until you locate Information Rights Management (IRM). 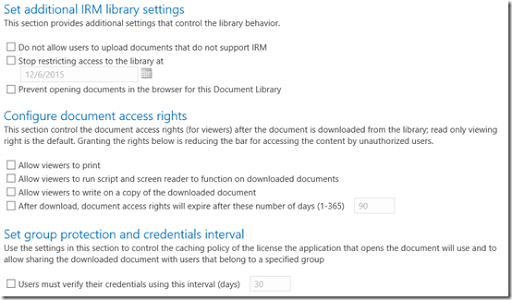 Select Use the IRM service specified in your configuration. Scroll to the bottom of the page and select OK to save your configuration. 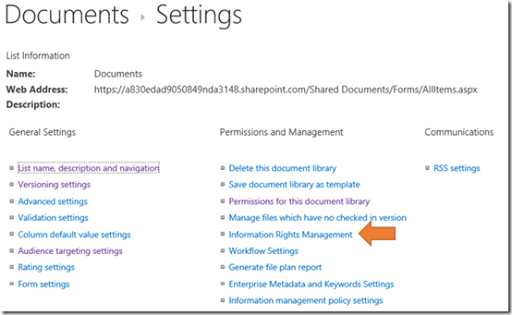 Navigate to the item you wish to protect in SharePoint Online, here a Document Library. Select the Library tab at the top left of the page to reveal the Ribbon Menu as shown above. On the very right of the Ribbon select the Library Settings icon. From the column in the middle of the page with the heading Permissions and Management select the Information Rights Management option. Ensure the Restrict permissions on this library on download is checked. Also give he policy a title and description. If you select the Show Options link below these description fields you’ll see a number of different options you can use to customise how the rights will be applied to the documents. When complete, select the OK button at the bottom of the page to save your configuration. Basically now when a document is downloaded from that library and opened by someone without appropriate permissions they will see the above message preventing them from accessing the document. There is whole lot more you can do with rights management in Office 365 but hopefully this post has given you enough to get started on the journey of securing your documents better. where you’ll find lots and lots of courses on Office 365, SharePoint, Azure and more. These courses help support the information I provide here for free and on my YouTube channel, podcast, etc. I appreciate everyone who has already signed up to one of my courses and keep your eyes peeled for more coming soon.